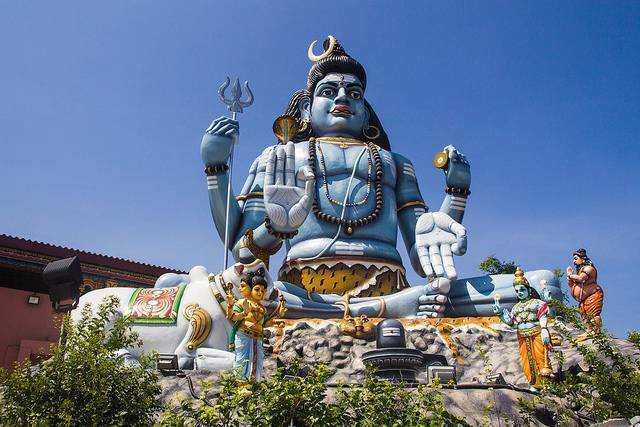 Koneswaram temple is located in Trincomalee in the eastern province of Sri Lanka and was built when the Cholas ruled over the country and is mainly dedicated to Lord Shiva in the form of Kona-Eiswara also known as Konesar. It is a Hindu temple complex and also a major place for Hindu pilgrimage. The temple is regarded to have a majestic kibd of architecture. The temple has numerous gold embedded gopurams and an elaborate sculpture of a black megalith with bas-relief ornamentation. Other than Shiva, the shrines include of Ganesh, Vishnu, Bhadrakali, Surya, Ravana, Thirumal, Murukan and Ambal-Shakti. The temple celebrates its annual festivl also called as Ther Thiruvilah which includes the Bhadrakali temple of Trincomalee, the Pavanasam Theertham at the preserved Papanasuchunai holly well and the proximal Black Bay Sea which surrounds the Konesar Malai. However, the temple complex was highly destructed during the religious attack in the country that took place in the year 1622 and 1624.